Can Reward Program Reduce Pedestrian Accidents in Tampa? What If Tampa Residents Got a Reward for NOT Breaking the Law? The Tampa Police Department will be trying a new approach to reduce accidents at our city’s most dangerous intersections, according to ABC Action News. As early as December, the TPD will be increasing enforcement on specific problem roads, but officers won’t just be issuing out tickets and citations for those breaking the law — they will be rewarding those who follow the law as well. Could this new program be the answer to Tampa’s pedestrian and bicyclist accident problem? This new reward program is the result of a contract between University of South Florida and the Tampa Police, as well as a $60,000 grant from the Florida Department of Transportation, to attempt to lower Tampa’s rate of pedestrian and bicycle accidents. Both of these are major problems in our metro area. Tampa Bay ranked second-worst in the nation for pedestrian deaths in 2014, according to a report by the National Complete Streets Coalition. Our state also has the highest bicycle accident death rate in the country, and Hillsborough and Pinellas County in particular are among the most dangerous counties in Florida for cyclists, according to the Centers for Disease Control. Police will increase their presence along the most complained about areas in Tampa, including Busch Boulevard, East Fowler Avenue, and Hillsborough Avenue. But unlike previous attempts to bolster police enforcement, officers will be offering rewards to law abiders to see if it incentivizes safer driving. Along with handing out fliers to advise residents on road safety practices, officers will be offering gift certificates to encourage good behavior, such as yielding for pedestrians and using the crosswalk to cross the street. Will the Reward Program Reduce the Accident Rate? We won’t be able to know the impacts of this new reward program on Tampa until it is implemented. But there is strong precedent for this type of program making a difference. A spokeswoman for the FDOT told ABC Action News that the number of pedestrian and bicycle accidents has gone down by 20 percent in cities where this reward program has been implemented. This reward program idea was originally created by a Seattle Police Department officer after his wife had been hit by a driver who failed to yield at a crosswalk, according to City Lab. He handed out gift cards to drivers who stopped for pedestrians to reward their behavior. Three years later, this idea was scaled up and launched as a part of Seattle’s Vision Zero Initiative. Now it’s being seen in cities such as Santa Maria, Dallas-Fort Worth, and soon, Tampa. For residents hoping for a gift certificate from the TPD when the program launches, here are some safe behaviors the police will be looking out for. The busier and more dangerous intersections in Tampa can truly be challenging for pedestrians to cross, especially if they are seniors or have mobility issues. The TPD wants to encourage drivers to yield to pedestrians crossing and be more cautious in areas where pedestrians are present. Speeding doesn’t just increase the likelihood of a crash — it also makes accidents involving pedestrians far more deadly. More than 80 percent of pedestrians die when hit by vehicles moving at 40 mph or faster, but fewer than 10 percent of pedestrian crashes at 20 mph result in a fatality, according to the Federal Highway Administration. Although texting and driving is considered a secondary offense in Florida — which means an officer cannot pull you over and issue a ticket solely for using a smartphone while driving — it is still a dangerous form of distracted driving. In 2014 alone, 3,179 people were killed as a result of distracted driving crashes, according to the National Highway Traffic Safety Administration. If you want to keep yourself and others on the road safe, refrain from using your phone and other distracting activities while driving. Motorists aren’t the only ones on the hook for risky behavior. 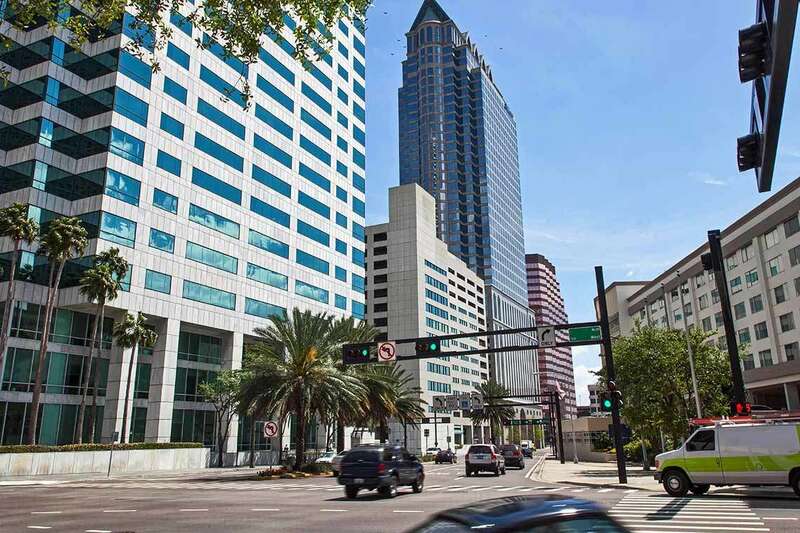 The TPD wants to prevent pedestrian jaywalking on the most dangerous roads in Tampa. Officers will be rewarding pedestrians who use the crosswalk to safely cross the road, rather than darting across the street in the middle of the road. Many hope that this new reward program will have as much success in Tampa as it has in other cities. But until it is implemented, pedestrians, cyclists, and motorists alike will still be at risk of car accidents on our city’s most dangerous roads. If you or someone you love have been hurt in a car accident caused by the unsafe driving of another motorist, we may be able to help. Read more to learn how our car accident attorneys can negotiate with the insurance company on your behalf to try to get you the compensation you need and deserve. If you are ready to pursue a claim, fill out our free, no-risk case evaluation form today.